When Ferrari unveiled the new 2013 F12 Berlinetta in Geneva in March, it drew a lot of attention. And this weekend the most powerful production car in the history of the Prancing Horse was the center of attention again as it was auctioned off for $1.125 million at a Ferrari event in Austin, Texas during the Formula 1 U.S. Grand Prix weekend. The proceeds from the first F12 Berlinetta to be delivered in the U.S., will go to benefit the Hurricane Sandy relief efforts. That brings the total to over $1.5 million that Ferrari has raised for the American Red Cross society to help the areas most affected by the devastating superstorm that hit the East coast. Since Hurricane Sandy hit the North East, another $345,000 in donations have come from Ferrari dealers, clients and friends, and another $50,000 was raised through on-line and personal donations. This isn’t the first time Ferrari has moved to support relief efforts. In the aftermath of the recent natural disasters in Japan and Italy, Ferrari also was successful in raising funds for relief efforts around the globe. The Italian automaker has been more than generous as they have reached out to help the victims of tsunamis and earthquakes. They also helped people in the Emilia Romagna region of Italy earlier this year, when a rare 599XX Evo was sold for $1.78 million to help the earthquake victims. The powerful F12 Berlinetta drew a lot of attention, just like it did at its debut in the U.S. at the Concours d’Elegance of Pebble Beach earlier this year. At the auction on Saturday, the F12 with a list price of $315,888 drew strong participation from attendees as the bidding quickly rose to $1.125 million. Bidders who could not attend the event in Austin, Texas could also pre-arranged to bid via phone. The event was a huge success for Ferrari and especially for the Hurricane Sandy victims. The huge superstorm is estimated to cost the U.S. billions for the victims to clean up and rebuild their lives. 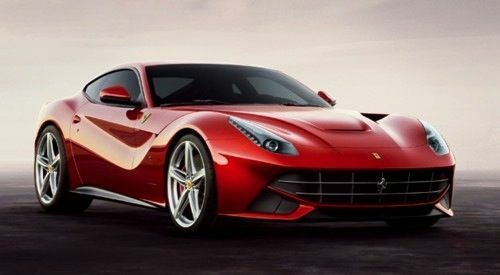 The first F12 Berlinetta will be delivered here in the U.S. in the second quarter of 2013 and the new supercar boasts Ferrari’s most powerful 6.3-liter V12 at 729 horsepower and 508 lb ft of torque. The F12 Belinetta gets a considerable 120 more horsepower than the Ferrari 599 GTB it replaces. The sports car has a lower weight by 129 pounds and will launch from 0-62 in just 3.1 seconds with a top speed of 211 mph+. The new F12 will propel the driver from 0-124 mph time in 8.5 seconds, which is quicker than a McLaren F1.